Did you know that Shailesh Lodha who is famous as “Taarak Mehta” in the popular tele-serial “Taarak Mehta ka Oolta Chashma” is also a motivational speaker and works for social happiness? Did you know that the company of a young woman runs 800 ambulances in 18 states across the country? Did you know about a fabulous new way to charge your phone from solar energy? Or ever been part of a laboratory where you can imagine almost anything? Did you ever experience rural transformation through micro credit finance revolution? This unique kind of inspiring and energetic set of people – mostly young new talent in the field of innovation and social entrepreneurship spoke at the Aditya Institute of Management Studies and Research on Friday, Feb 28, 2014. Business founders and CEOs from various business sectors were present and shared their experiences with management students from across the country in 2nd National Innovation Summit. 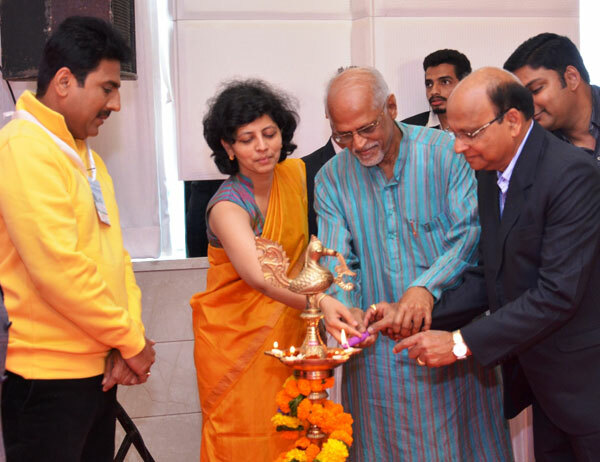 Veteran TV actor and poet Mr. Shailesh Lodha aka Taarak Mehta from TV serial ‘Taarak Mehta ka Ooltah Chashma’ inaugurated the Summit on Friday morning. Dr. N. Ravichandran, former Director, IIM Indore and current Professor, IIM Ahmedabad released the academic research journal Shodhaditya as part of the program. Young entrepreneurs such as Ms. Sweta Mangal, Co-founder and CEO, Ziqitsa Healthcare Ltd spoke about her journey since she left a lucrative job to found the famous “1298” ambulance service. Mr.Pravin Rajpal, Founder, Imagination Lab, highlighted the concept of risk and disruptive innovation. Each of these eminent speakers interacted with students to engage them into businesses for social change. Innovation in the field of equity and finance was discussed by well-known personalities like Mr. Anand Rathi, Co-founder & Chairman, Anand Rathi Financial Services Limited, Mr.Vikaas M.Sachdeva, CEO at Edelweiss Asset Management Ltd. and Director at Association of Mutual Fund in India (AMFI), and Ms. Meenal Madhukar Senior partner, IFMR Capital. Mr.Pankaj Mathpal, Managing Director, Optima Money Managers, Mr. Devesh Kumar, Founder, Kaamwala.com, Mr. Deepak Karanjikar, Noted Actor & business consultant will also grace the event.